What is a DEXA/Bone Density Scan? A bone mineral density (BMD) test measures the density of minerals – such as calcium – in your bones using a special X-ray. A DEXA bone density scan provides an estimate of the strength of your bones. Dexa scan uses two different X-ray beams to estimate bone density in your spine and hip. The amounts of each X-ray beam that are blocked by bone and soft tissue are compared to each other. Bones with higher mineral density (BMD) allow less of the X-ray beam to pass through them. Dexa is the most accurate method for measuring BMD. Dexa can measure as little as 2 percent of bone loss per year. It is fast and uses very low doses of radiation. Avoid wearing clothes with metal buttons or buckles for the test. You also may want to remove any jewelry that might interfere with the scan. You will lie on your back on a padded table. You can usually remain fully clothed. You may lie with your legs straight or with your lower legs resting against a platform built into the table. The machine will scan your bones and measure the amount of radiation they absorb. Testing at least two different bones each time – preferably the hip and spine is the most reliable way of measuring BMD. It is best to test the same bones and to use the same measurement technique and BMD equipment each time. The DEXA technique, which scans the hip and lower spine takes only about 20 minutes to perform. Usually there is no discomfort during a bone density test. 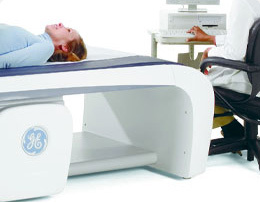 If you have back pain, it may be uncomfortable to lie still on a table during the scan. Your provider will interpret your exam. The technologists who administer the test cannot interpret or discuss what they are viewing while performing the exam. A report will be mailed to you regarding test results. To schedule an appointment for your next Bone Density test, please call (713) 341-2100 Option 2 to speak directly to one of our receptionist.